It’s generally a safe bet to book your cruise as early as possible. Some people book a year in advance even. If you’re the type of person who wants to book in advance to lock in the best price, don’t stop there. Make sure to keep an eye out on the prices throughout the rest of the year. If the price of your cruise changes or a better promotion pops up, then you can change your booking to take advantage of the new pricing or special. So make sure to always keep on eye out of prices and sales throughout the year. 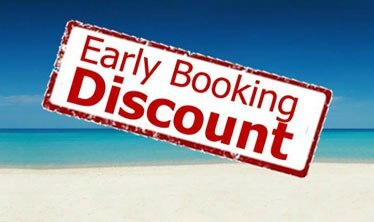 If you find a better/cheaper offer than what you have booked, call your booking agent immediately to rebook the better deal. Unlike airlines, most cruise lines offer free cancelation as long as you do so before the cancelation period which varies by each cruise line and itinerary. Typically the cancelation period for a cruise vacation is a month or two before the sailing date, so you’ll generally be able to book your cruise early and cancel without penalty anytime before then, and be able to book again if you find a lower price.